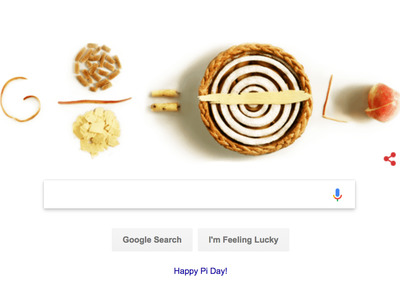 Google/ScreenshotThe Pi Day Google Doodle looks delicious. The day celebrates the number π, 3.14, and is also Albert Einstein’s birthday and now the day Stephen Hawking died. If you’d like to celebrate the day with a delicious pie, Google got Cronut creator Dominique Ansel to share a recipe for a salted caramel apple pie. If you haven’t baked your favourite pie to celebrate Pi Day yet,Google has you covered. Today, March 14th, is the 30th anniversary of Pi Day (for, you know, 3/14 or 3.14). Not only does the day recognise the tasty-sounding mathematical constant that “represents the ratio between a circle’s circumference (perimeter) to its diameter (distance from side to side passing through the center),” it’s also both the birthday of Albert Einstein and now the death day of famed theoretical physicist Stephen Hawking. The number Pi itself (Greek letter ????) in an irrational number that can’t be represented as a fraction of two whole numbers (though we often use 22/7, which works well enough). And it’s a number that continues to infinity. So far, mathematicians have calculated it out to 22 trillion digits. The recipe itself looks delightful – and includes bourbon.Check it out here. Pi Day was first recognised and celebrated by physicist Larry Shaw in 1988. So go ahead and celebrate with a slice – it will be even more special in tribute to Stephen Hawking.